C3 coordinator Jessica Thompson helped us channel our inner Pop artist during last Friday’s Late Night Studio Creations workshop, where visitors used laundry bags, cardboard, magazine clippings, and handkerchiefs to create collages of their favorite Dallas icons. By the end of the night, the studio’s back wall had transformed into a fantastic community installation that gave International Pop a run for its money. Bubble wrap and plastic and glue, oh my! It isn’t easy to pick a favorite, but I’d have to go with the collage of Big Tex during his final moments in 2012. What are your favorite Dallas icons? Because the Dallas Museum of Art is closed to the public on Mondays, those days are often strangely quiet without the buzz of school children and families in the Center for Creative Connections (C3). However, on Monday, October 5, C3 was brimming with energy from some of the creative educators, artists, and community organizers that make Dallas great. Earlier this year we were approached by the Sam Francis Foundation to be one of three organizations across the country to host a roundtable event focused on the Future of Creativity. Where and how does creativity thrive? Following their 2014 roundtables, the Sam Francis Foundation compiled their findings in this report. In twenty years how will creativity shape the world we live in? How will creativity inform our decision-making? What new conditions will be needed to unleash creativity? If we were building a “creativity tool-kit” for future generations – what tactics, methods, and advice would we include? 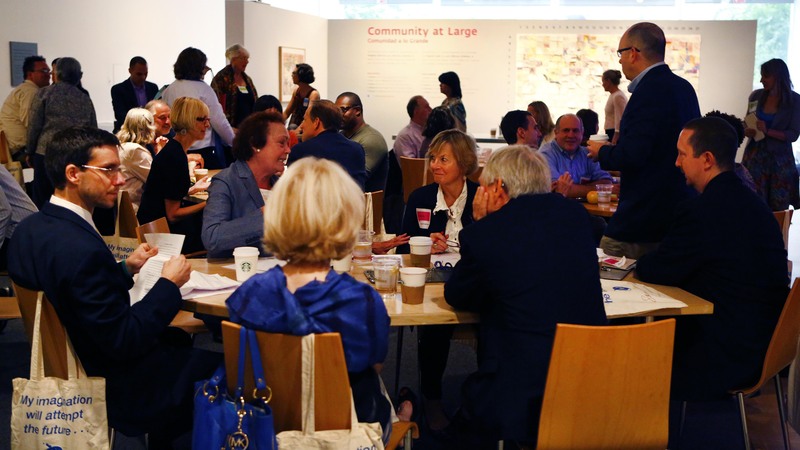 It was truly remarkable to have so many Dallas leaders, artists, and educators (many of whom we have worked with closely in the past) together in the Center for Creative Connections. The conversations were dynamic, engaging, and inspirational. Yet, these roundtables are just part of the beginning stage for a grander plan involving community building, the creation of programs, and a public awareness campaign in support of the future of creativity. In the end, I will leave you with some of my favorite quotes from the day. Some are specific to creativity, and others are general gems to keep in mind. This summer, visitors to the Center for Creative Connections have participated in a communal drawing activity called Community at LARGE. Individual visitors enlarged one small portion of Progress Suite by Luis Jimenez and added their drawing to a large gridded wall, so that collectively they have created an enlarged reproduction of the original lithograph. Initially, it was exciting to watch as the blank wall slowly filled up with drawings and the image became recognizable. But now that each square has been drawn, the fun part has been watching as the drawing changes from day-to-day with the addition of new visitor contributions. Here are a few short flipagrams of the evolution of my favorite squares. Stop by the Center for Creative Connections during your next visit to the Dallas Museum of Art to make your own contribution to our communal drawing. Look for more photos of this project on Instagram and Twitter with #DMAlivingdrawing. Whether you’re seeking sunburn-free, sweat-free fun this summer or new experiences to share with your family, the DMA has what you’re looking for! As usual, the Art Spot in the Center for Creative Connections is open every day for art-making and exploration, and our Family Guides are always available at the front entrance for exploring the galleries. Weekdays and Saturdays through June and July will also offer different (air-conditioned!) 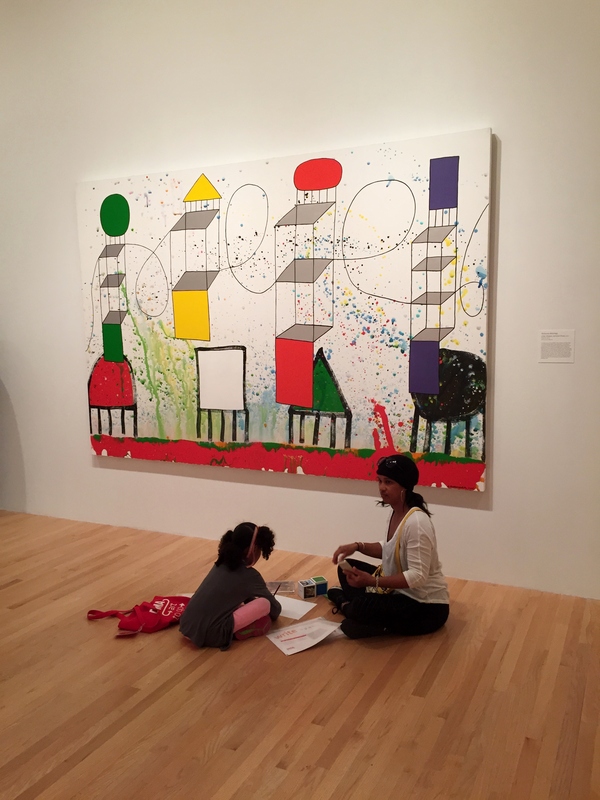 activities as part of the DMA’s Summer Family Fun. These activities include the Pop-Up Art Spot, story time and family tours, and our wonderful Art to Go Family Totes. A family using the Color Art to Go Family Tote and story dice in Between Action and the Unknown: Shiraga/Motonaga. An important thing to note is that the Art to Go Family Totes are only available this summer on Tuesdays between 11:00 a.m. and 1:00 p.m.! In June, we’ll have them out for use in Between Action and the Unknown: The Art of Kazuo Shiraga and Sadamasa Motonaga, and in July you can find them up on Level 4 in Formed/Unformed: Design from 1960 to the Present. If you can’t wait to make it to the Museum to try out our Totes, or have already enjoyed them and wished you could have the Art to Go experience at home, here’s a quick and easy DIY to help you recreate one of the activities from our Color Tote. The Art to Go Family Totes include activities to MAKE, PLAY, TALK, and WRITE. 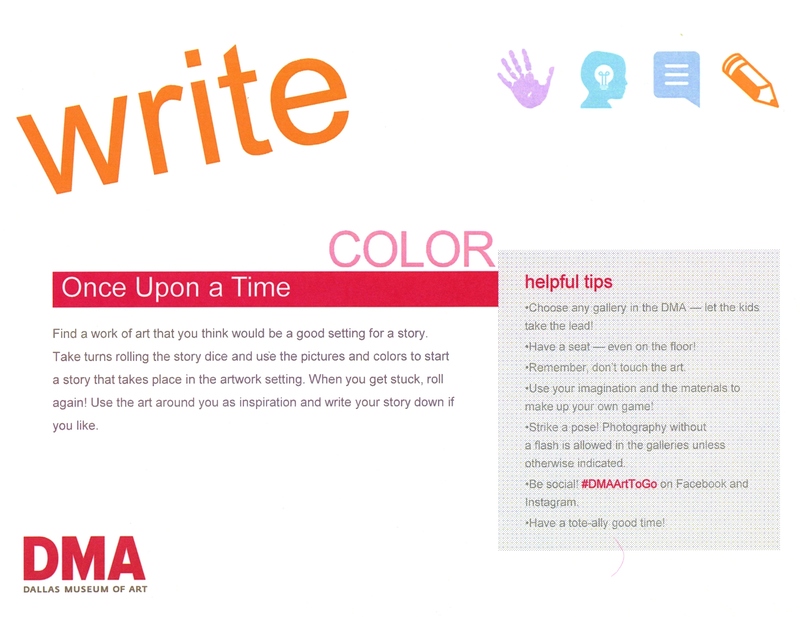 This “Once Upon a Time” writing activity is one of our favorites and includes two ‘story dice’ to inspire a story written with a piece of artwork as its setting. Our dice are pretty simple–images of possible main characters and colors are pasted on the sides of two cube-shaped cardboard boxes (small ones that fold down for easy storing). 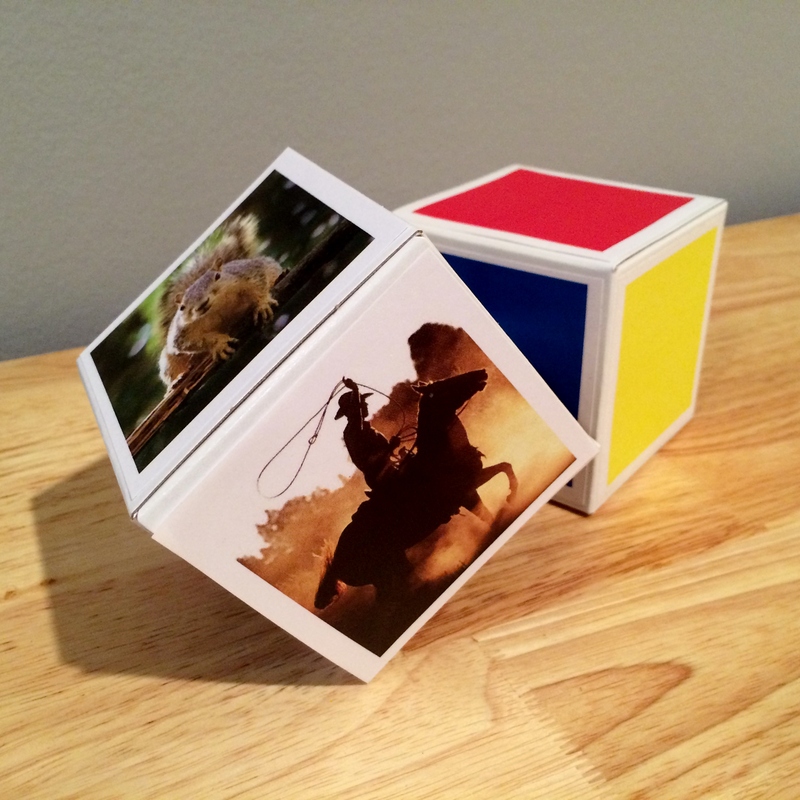 To make your own story dice at home, you could use boxes like we have here (big or small – play with proportions!). Other options include small wooden craft blocks or making your own paper cubes. If you’re feeling ambitious, you could even put together this twelve-sided paper dodecahedron to use instead of the traditional six-sided dice shape! Attach images of family members on one die and parts of an adventure on others: settings for the adventure, modes of transportation, treasures to hunt, etc. Fill one die with superhero images and another with giant monsters to face off in an epic battle! Make murder mystery themed dice (for older storytellers) with possible murder weapons, locations of the murder, and prime suspects. Have entirely artwork-based dice: cover one with your favorite portraits, one with landscapes, and one with still lifes or ancient artifacts–or anything else you might think of. With a little imagination and teamwork, any kind of story dice you create can lead to a GREAT story and a serious brain workout! You can even re-purpose your story dice. Maybe on a day when you’re feeling more like an illustrator and less like an author, just give your dice a roll and voilà! Your story ideas work just as well for creating a new piece of artwork. Have a go at it and let us know in the comments how your efforts turn out. And don’t forget to stop by the Museum to check out the rest of our Art to Go Family Tote activities and other Summer Family Fun experiences!